After the 13 hour fast boat adventure I spoke about in yesterday’s post we arrived in Tabatinga. We knew it was going to be a tight schedule to get to our plane but had no idea it would be this close. Our luggage was practically thrown from the boat onto the dock as we ran up the hill to catch the taxis that were waiting. You see, there is only one flight out of Tabatinga each day and we had to get there! When we arrived at the airport the plane was still at the gate but there were only 30 minutes before departure time. The man responsible for the ticketing and boarding of this flight never changed his expression or demeanor as he calmly told us we were too late to go through the security process and refused to even attempt to get us on the plane. No amount of begging or pleading was going to get us on that plane. We are rarely certain that he even asked for the plane to go ahead and pull away from the gate and depart 10 minutes early just to prove his point…which it did…and he did. I’m sure Satan was smiling a great big smile. However, Satan does not know the future. Have you ever thought of that? Satan has no idea what is coming next. He didn’t know how God would bless this group and give us a wonderful time to make some beautiful memories and actually see the culture of this amazing country. You see, because we missed our flight in Tabatinga, we also missed our flights in Manaus. Not only that, but the one flight out of Manaus for the next day was already full. 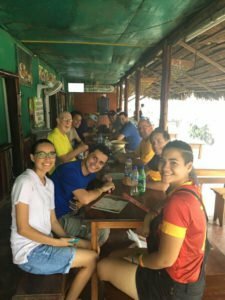 So, we had the extra day in Tabatinga then flew to Manaus and had an extra day in Manaus before we could finally catch our flights – 48 hours after our scheduled departure from this eventful trip. Once I got over the frustration of mixed flights and ticket change fees and a little apprehension over the type of hotel we might find in the middle of the night in Tabatinga I began to get excited about the fact that we were actually going to get the time on land in Brazil that I had wanted so badly. 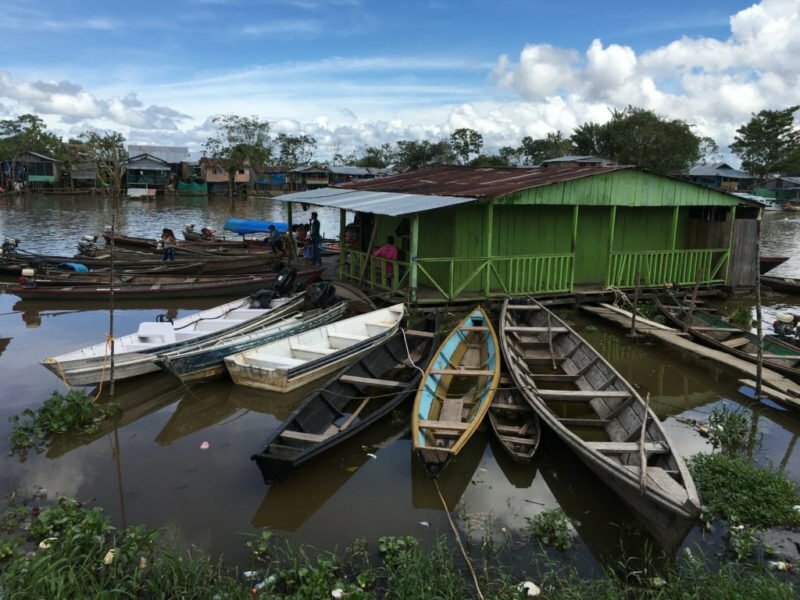 We were actually going to get to experience the culture and visit with the people rather than just watching them as we floated by on the Amazon River! Walking through Tabatinga, taking a taxi into Columbia for lunch and buying coffee, walking through the meat market (of my), looking across the river to Peru…none of these experiences were on the schedule and every one of them was amazing. Then, flying to Manaus and spending an entire day exploring that amazing city, touring the opera house, meeting a woman whose great-grandmother was the first educator in Manaus, shopping, eating ice cream…these were not scheduled but were incredible experiences as well. The afternoon spent at the home of a missionary family who has dedicated their lives to the mission of Christ in Brazil was a highlight of the trip. There will be more about this sweet family later. I started doing something, really as a joke, when things started going a little crazy on our trip and the adventure became a little more than I had planned. Each time something crazy happened I would think of something good was coming as a result and I would thank our coordinator for it. When the steering broke the first time – I thanked him that we could drift so close to one of the floating house groups because I really wanted to see them up close. When we almost capsized – I thanked him for the adventure and thanked him for waiting until I was not standing on the rail at the front of the boat. When we hit the log and had to tie up for 20-ish hours on the edge of the jungle – I thanked him because I had really wanted a chance to take some pictures of the birds and the vegetation while were still. I also really wanted to be able to hear the jungle sounds without the noise from the engine of the boat. I got both of those things because of one giant log. When we missed our flight – I thanked him that we were actually getting to stay in Tabatinga for an entire day to mingle with the people and see the sights. When our flights were full for the next leg of our travel – I thanked him because I really had wanted to experience Manaus and see the famous Opera House. So, my friends, now that we are back and I have had time to process the lesson God was putting before my eyes, I learned another valuable lesson. I think it is a lesson that we all must remind ourselves of often. When Satan breaks your steering for a while, creates an unexpected event that sends you full tilt, throws a log under your boat, steals from you, cuts your schedule too close, puts a stubborn personality in your path, cancels your flight, causes your plans to go haywire – God knows. He is at work in all things. I realized that God does this all the time. He takes our disappointments, changed plans, accidents, aggravating people, uncomfortable situations and brings amazing things into our lives. Better things than we could have ever dreamed or desired. Sweet brothers and sisters in Christ, all we have to do is be observant, be willing, and be grateful for the unexpected blessings. May God bless you as you begin to be thankful for your found blessings! Copyright ©2016, Kelly Moore, all rights reserved, Reprinted with permission from the author. Photos courtesy of Kelly Moore. All rights reserved. Kelly is a follower of Christ, wife, mom, teacher, musician, and artist. She is an observer of people and nature and is working on how to truly “live love”. She talks to birds and butterflies, and has been known to rescue baby snakes. She loves to get her hands dirty in the flower garden, and can lay on the sidewalk at night and watch the moon and stars for hours. Kelly just loves living!